Museum officials in Thailand have covered a billboard depicting Adolf Hitler saluting after complaints from the German and Israeli embassies. 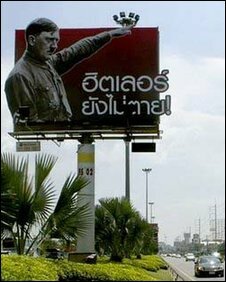 The advertisement, which reads in Thai, "Hitler is not dead," was set up on a main road out of Bangkok two weeks ago. The billboard was covered up after the museum received "a lot" of complaints, director Somporn Naksuetrong said. The series of highway advertisements featuring famous dead people promote Louis Tussaud's Waxworks in Pattaya. "We weren't showing his image to celebrate him," Mr Naksuetrong told AFP. "We think he is an important historical figure, but in a horrible way. We apologise for causing any offence which was not at all intended. We did not realise it would make people so angry," he added. German Ambassador Hanns Schumacher was quoted in the Bangkok Post as labelling the advertisement "tasteless" and complained directly to the Thai foreign ministry. The Israeli embassy protested directly to the museum, Mr Naksuetrong said.